You can taste Michizakura, Michizakura Shuzo. from Gifu prefecture, and Hanatomoe, Miyoshino Brewery. from Nara prefecture. Michizakura Shuzo is located in the northern part of Nakatsugawa city Gifu. It is near the border of Nagano prefectures. Nakatsugawa was a post town on the Nakasendo Highway and the city authorities have done much to preserve this Edo period heritage on the original road leading through town, which now has a number of Japanese sake shops, confectionery stores and restaurants housed in restored, wooden buildings and warehouses (kura). A severe winter climate is a very good environment for sake brewing. Water draws spring water from their own forest mountain. Sake rice is from their own rice field and local contracted farmer. The total production is just 200 Koku. It is a micro brewery size. Miyoshino Brewery is a small family-run brewery established in 1912. Nara prefecture, where Miyoshino Brewery is situated, was the ancient capital of Japan during the Nara period (710-794 A.D.) and it is also considered the historical heartland of sake. The brew master at Miyosino Brewery, Hashimoto stepped up to take the reins of his family business after studying at the famed Tokyo Agricultural University and at Kenbishi sake brewery. He changed the course of the brewery after developing a passion for the old fashioned ways of brewing, espcially the yamahai method of slow fermentation and the use of in-house, naturally occurring yeasts. 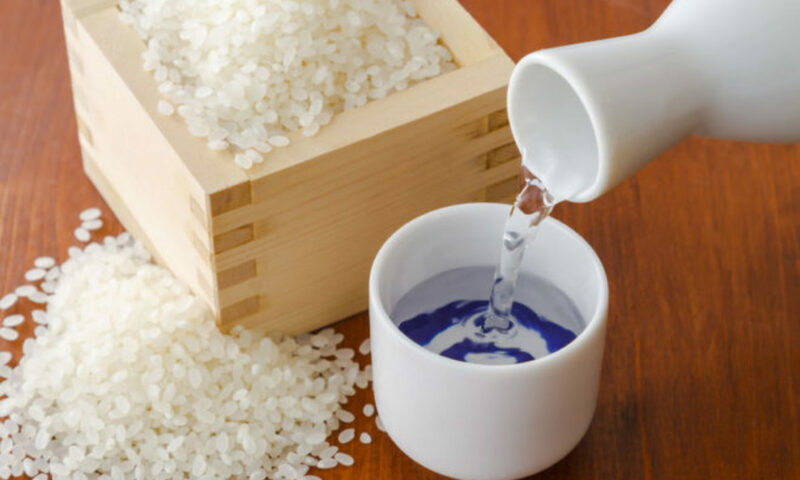 They also brought back the rare, original method of sake production called “bodai or mizumoto”––this method starts with raw rice and water which produces its own lactic acid due to naturally occurring bacteria and yeasts. Hanatomoe revives the “mizumoto” or “water brewing” method of produc- tion, using no added lactic acids or yeasts. Instead, the uncooked rice is steeped in water producing naturally occurring lactic acid. The resulting sake is high in acidity like tart green apples, yet is well-balanced and complex. Full-bodied, rich koji-rice driven aromatics, broad sweetness with an earthy base. High acidity is perfect for pairing will all foods! You can taste Kikusakari, Kiuchi Brewery Inc. from Ibaraki prefecture, and Hiraizumi, Hiraizumi Honpo from Akita prefecture. The water that gives life to KIKUSAKARI, is natural spring water from the well in our sake brewery. This water is soft water (close to medium hardness) which does not contain iron, organic matter etc. – the inhibitors of fermentation. There is a place named SAKAIDE about 1 kilometre east from our sake brewery, where there is an old legend that sake gushed out of a well there. The plateau of Naka where Kiuchi Brewery is located is land rich in water and greenery between Kuji River – famous for its sweetfish – in the east and Naka River – famous for its salmon – in the west. Delicious sake was almost certainly brewed with this good quality water from long ago. In recent years, their sake has been brewed with the young sensibility and original techniques of our master brewer while also continuing to use their inherited traditional techniques of Nanbu-Toji. By fusing the spirit of tradition and enterprise, they also challenge the new and the unconventional. They work every day by trial and error to brew a Japanese Sake that will be loved worldwide. The sake brewers of Kiuchi Brewery are also following their dreams. You can taste Amanoto, Asamai Shuzo from Akita prefecture, and Aizuhomare, Homare Sake Brewery Co.,Ltd. from Fukushima prefecture. Founded in 1917. Asamai Shuzo is located in center of the Yokote Basin in southern Akita Prefecture. Yokote Basin is known in Japan as an area of heavy snowfall, and for agricultural products, mainly rice, but also for apples and asparagus, etc. In Yokote city itself has got 5 sake breweries. The major ingredient of sake, rice, differs from region to region, but breweries tended to use both local rice and rice from other regions, the difference between various regions’ rice varieties has not been given much thought. Recently, however, the sake industry has been increasingly favoring local rice and therefore creating regional differences in sake. This requires an increased interest in the way that growing conditions affect the rice and, therefore, the regional expression of each sake. Asamai Shuzo takes their sake rice seriously. They brew sake from only by local rice within 5 km from their brewery site. Since 2011 they produce only Junmai sake, which is sake made from only rice, water, yeast, and koji. Sake brewing process is more complicated than wine’s one and 80% of sake is water, because of that it is not very significant characteristic of terroir as much as wine. But Asamai Shuzo’s sake is a kind of sake “terroir”. Founded in 1918. Homare Sake Brewery marked the 100th anniversary in September 2018. It is located in Kitakata. Kitakata is a small town, surrounded by mountains and rice fields in the Aizu region of Fukushima prefecture. Renowned for its traditional storehouses, kura, and ramen, it also boasts eleven sake breweries. Strolling around town, these are easily identifiable from large balls of cedar hanging outside, known as sugidama or sakabayashi, which mark the production of a new sake. When the green needles turn brown, it’s said that the sake has aged enough to be ready for drinking. The natural geography of Kitakata, and indeed the entire Aizu region, lends itself to the production of high quality sake. The cold climate allows a slower fermentation process and rice has plenty of growing space. Crucially, though, there’s an abundance of water from nearby Mount Iide. This is soft water, which also slows the fermentation process, yielding a sweeter taste. Fukushima prefecture has become one of the most acclaimed sake-producing regions in Japan. FUKUSHIMA – Fukushima Prefecture was home to the largest number of award-winning sake brands for the sixth year in a row, marking a record in an annual competition, the National Research Institute of Brewing in 2018.